I'm not sure if the "Heroes From Beyond" label applied to a certain set of superheroes, i.e. 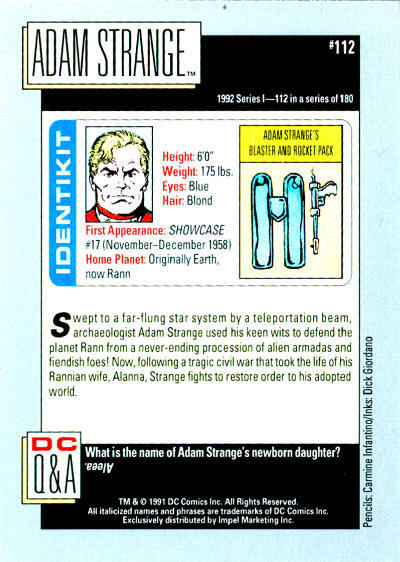 sci-fi superheroes like Adam Strange or Captain Comet, or all DC heroes, but it would interesting to know. Hooray for calling it a rocket pack and not jet pack! "Heroes From Beyond" and "Villains From Beyond" covered outer space/cosmic characters. 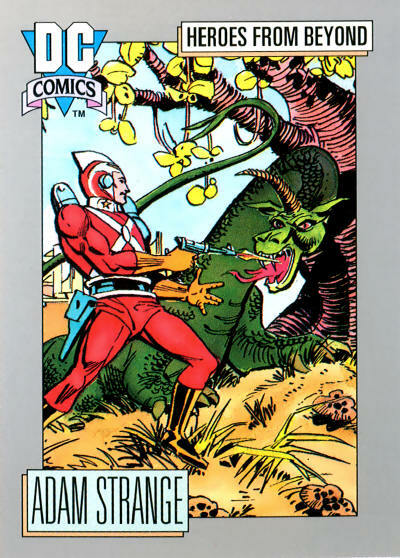 However, the card set was far from all-encompassing, leaving out such mainstays as the Atom and lesser knowns like Captain Comet. Instead, we got some New Gods, some Green Lantern types, two Tamaranians and some JLI characters (friggin' Mr. Nebula!) The only reason Adam made the cut was the Bruning/Kubert mini-series of the time, since characters without their own current books were mostly set aside. I like! I love the Silver Agey art on the front. I definitely get a kick out of all those weird monsters and aliens from the sixties. 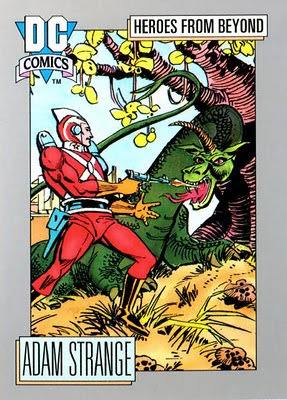 I have this card and a bunch of other ones like golden age hawkman and a bunch more. If anyone wants to buy these from me please comment back I have no use for these.